Dalloway Terrace, a restaurant and bar, is part of the Bloomsbury Hotel in the heart of Bloomsbury. It is a gorgeous indoor-outdoor terrace decked out in a floral design which almost gives you the sense that you are in some luxury English garden. The décor is relaxed, yet has a sense of urban sophistication to it. 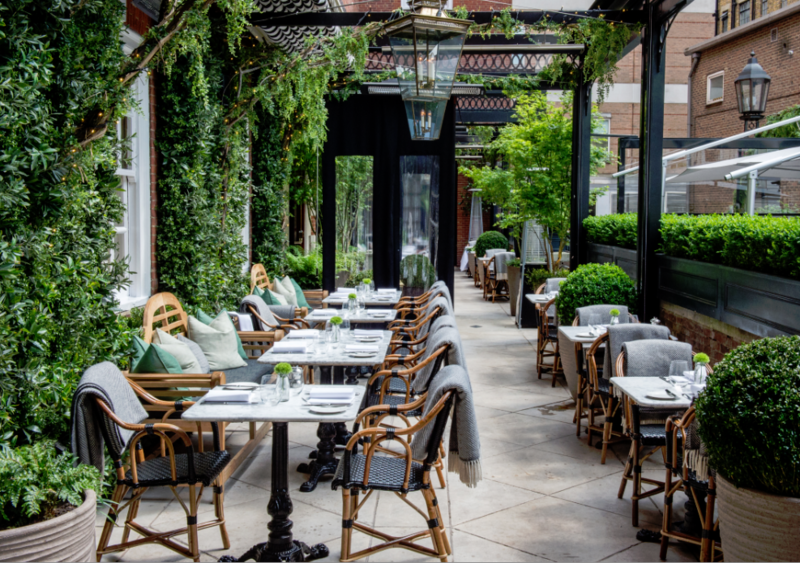 The covered element is also heated in the winter months, and so Dalloway Terrace works well all year round, whether it is hot, wet or cold. Both a restaurant and bar, Dalloway Terrace serves a very versatile menu, ranging from breakfast to brunch to small bites, as well as an all day dining menu featuring salads and larger sized mains. There is also delightful selection of cocktails, and a recent addition was the launch of its afternoon tea menu. 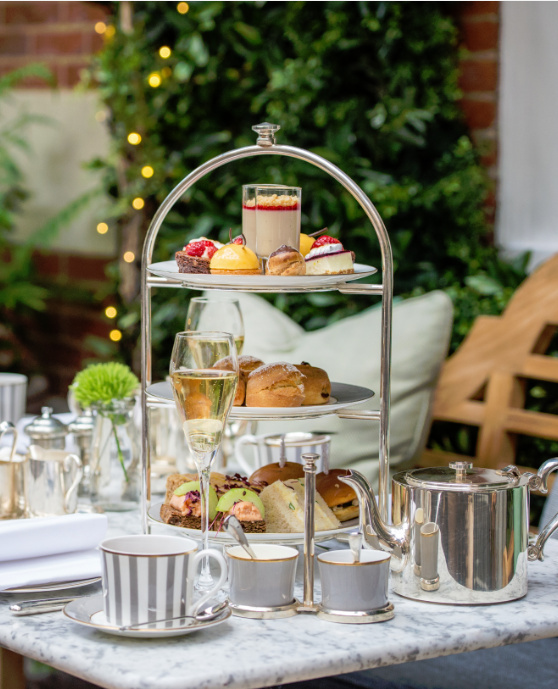 The afternoon tea is priced at £30, or £35 with a glass of English Sparking wine, or £40 with a glass of Perriet-Jouet champagne. As standard with most afternoon teas, there is a selection of sandwiches, scones and pastries. ; Cornish ham and relish; free-range egg, mustard cress and Kentish cucumber; and Organic smoked salmon and crab rillettes on Guinness bread. All the sandwiches were really nicely done, but it was the salmon and crab on Guinness bread that was the true highlight. The Guinness bread had a beautiful texture, and was delicious with the sweetness of the bread contrasting well against the savoury and tasty rillettes. The freshly baked scones were good too – ever so slightly crunchy on the outside and soft on the inside. There was a choice of two, plain and sultana and buttermilk. The scones were accompanied by some Devonshire clotted cream and homemade strawberry jam. , chocolate brownie, mango and passion fruit dome and a cheesecake. We liked the éclair, and the brownie proved to be rich and gooey. The Mango and passion fruit dome was also enjoyable with its citrusy overtones. However we found the cheesecake to be very bland. The tea choices were standard and there wasn’t a menu listing teas with origin or provenance, etc. In this regard, Dalloway Terrace could have been better. This was a very respectable afternoon tea experience, made particularly pleasant by the lovely backdrop and warm charming service. The sandwiches were good and the scones were tasty, although the execution on some of the pastries could have been better. 1) The salmon and crab rillettes on Guinness bread. 1) A couple of the pastries were poorly executed. 2) Teas showcasing origin or provenance.